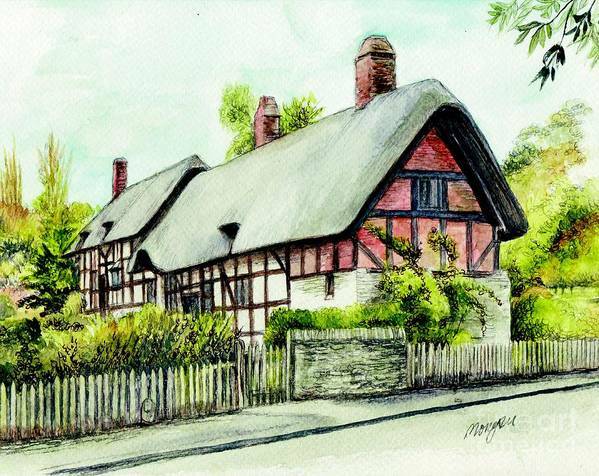 Anne Hathaway Cottage England by Morgan Fitzsimons - 8.000" x 6.375"
Anne Hathaway Cottage England art print by Morgan Fitzsimons. Our prints are produced on acid-free papers using archival inks to guarantee that they last a lifetime without fading or loss of color. All art prints include a 1" white border around the image to allow for future framing and matting, if desired. There are no comments for Anne Hathaway Cottage England. Click here to post the first comment. 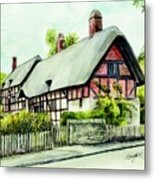 painting of Anne Hathaway`s cottage by english artist Morgan Fitzsimons, Anne Hathaway (1556 � 6 August 1623) was the wife of William Shakespeare Anne Hathaway is believed to have grown up in Shottery, a small village just to the west of Stratford-upon-Avon, Warwickshire, England.